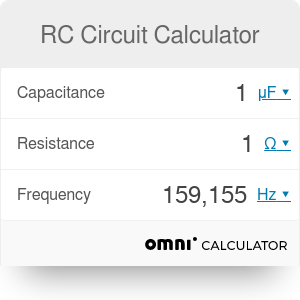 Use this RC circuit calculator to compute the characteristic frequency of the RC circuit. You can also use it as the capacitor charge time calculator (the RC time constant calculator) or the RC filter calculator. Depending on the need the RC circuit can serve as a low pass filter or high pass filter. and the capacitor can be used to store the energy. a capacitor charge time calculator. If you want to learn more about the resistance and capacitance, check out our parallel plate capacitor calculator. The characteristic frequency f determines the frequency of signals that can flow through the circuit. The RC circuit suppresses frequencies smaller than f, and signals with frequencies larger than f can flow freely. However, this is not a clear-cut situation, and signals with frequencies around f are still partially transmitted. Depending on the configuration you can use the RC filter to either filter out low or high frequencies. These are the high pass and low pass filters. If you combine a low pass filter with a high pass filter, you get a broadband filter that suppresses all the signals below and above some frequencies. All of our music equipment is full of broadband filters. If we connect the RC circuit to a DC power supply, the capacitor will start to collect electric charge until it gets fully charged. The time it takes depends on the capacitance of the capacitor C and the resistance of the resistor R controlling the current, which is the amount of charge ending up in the capacitor per one second. The larger the capacitance or the resistance, the longer it takes to charge the capacitor. Charging of the capacitor is an exponential process, the more charge there is, the longer it takes to gather more charge. The capacitor charge time is the time it takes for the capacitor to get charged up to around 63%. If you double the time, you get about 87%. To check the capacitor charge time calculator click the Advanced Mode. To compute the frequency just specify the resistance and capacitance in the calculator. You can also fix the frequency and, for example, the resistance to find the required capacitance. To check the capacitor charge time, open the Advanced Mode. You can try also other calculators related to the electric circuits such as the power factor calculator. RC Circuit Calculator can be embedded on your website to enrich the content you wrote and make it easier for your visitors to understand your message.